A magical peach! An imprisoned boy! Insect friends! An incredible journey…all wrapped in a play! This amazing adventure of James Henry Trotter will fulfill the fantasy of anyone who has ever dreamed of escape. 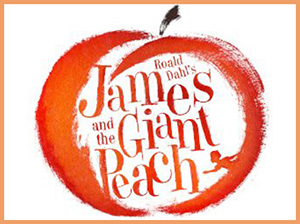 Roald Dahl’s story comes hilariously to life in this delightful dramatization that reveals the wickedness of some, the goodness of others, and the indecision encountered by many when they are faced with crises. You will see James (as he cleverly gets the Peach out of danger), the wise Old-Green-Grasshopper and the pessimistic Earthworm. You will also see James’ mean Aunt Spiker and cruel Aunt Sponge come to a suitably sticky end.